When previously acclaimed top San Bernardino County gang prosecutor Michel Seylem resigned under fire early this month, it was welcomed news for members of the community who were shocked and disgusted by his xenophobic and racist rantings on social media. After a six-month investigation that began when an internal complaint was filed against him last June, rather than firing him the District Attorney’s office allowed him to make a voluntary exit. Much has been written about his derogatory social media postings that included disparaging remarks about former First Lady Michelle Obama and U.S. Congresswoman Maxine Waters, a racial reference to immigrants and a racially despicable comment about a Black man shot and killed by police, however, little has been said about the dedicated and relentless efforts of the community that played a pivotal role in his resignation. Beyond the abrupt ending to Seylem’s career and the salacious details of his postings, there is an even more compelling story about how a community came together and demanded justice and accountability on this issue. According to Norwood, Seylem’s comments became public because someone from the DA’s office who [for obvious reasons] did not wish to be identified, sent the posts to the Sun Newspaper to expose him. There was some concern The Sun possibly delayed publishing the story. (The IE Voice made attempts but was unable to confirm this speculation before publication.) Regardless, the D.A.’s office launched an internal investigation into the postings in late June 2018 and The Sun first published the story in early July 2018. On the heels of the election in June, having successfully achieved their objective by unseating Ramos, Norwood was in the process of consulting with the local organization, Congregations Organized for Prophetic Engagement (C.O.P.E. ), a faith-based coalition working to train and develop the capacity of religious and lay leaders in congregations across the Inland Empire to protect and revitalize local communities. They were working to develop the recent #ReThinkPublicSafetySB campaign. “The campaign, rooted in public safety, is intended to shift the narrative around what public safety looks like for communities of color here in San Bernardino.” The goal, according to Norwood is to work from a data driven perspective and really focus on helping to support investments in programs aimed at rehabilitation, youth-focused initiatives, immigrant protections, etc. “That’s actually what we think public safety is,” she stressed. It was during this period, on the heels of the election and the work with C.O.P.E., Norwood shared, “that the Seylem comments came across my desk [holding him accountable for his postings] completely aligned with the work and values we were advocating for.” Bringing more attention to Seylem’s social media postings was essential to the ultimate end of his career with the San Bernardino District Attorney’s Office. Norwood knew that one of the key values of COC is protecting Black women. Therefore, engaging COC’s digital organizing campaign team could bring support, awareness and publicity to an effort to hold Seylem accountable for his actions. Norwood first engaged the campaign department of COC (the nonprofit organization not the COC political PAC). “After bringing the issue to their attention, there were local members I had built relationships with from work we had done previously. Some of our members were outraged,” she highlighted. One such member was Aaron Bratton who was so incensed, he launched the first petition calling for the termination of the Deputy DA. Bratton is a third-generation African American resident of Ontario whose father, Walter Bratton, was the city’s first Black firefighter. A graduate of Ontario High School who earned his undergraduate degree in political science at Cal State University San Bernardino and a recent graduate of Pepperdine University Law School, Bratton made the decision to bring his passion, education credentials and talents home to the County of San Bernardino and is already working to serve the greater good. He is a political & business consultant, as well as managing partner for Shining City Advisors LLC. In addition, he is currently the Lead Organizing Consultant for the #ReThinkPublicSafetySB coalition. Bratton was initially a strong supporter of Public Defender Edward O’Brien in the race for San Bernardino County District Attorney. After O’Brien withdrew from the campaign, although Bratton was not a part of Anderson’s campaign team, he supported him and made some introductions to members of the community. “When the Michael Seylem story broke, we wanted Ramos to fire him immediately and he kept stalling,” Bratton explained during an exclusive interview with the IE Voice/Black Voice News. Bratton and Norwood coalesced with other organizations in the effort to oust Seylem. They included the #ReThinkPublicSafetySB coalition, C.O.P.E., the ACLU, the San Bernardino Chapter of the NAACP and others. “They [public officials] kept saying, ‘we have to let the investigation play out.’ What investigation? They stretched it out and circled the wagons,” Bratton stressed adamantly. Bratton’s petition calling for Seylem’s termination gained a lot of support, momentum and traction. Other organizations saw it and spread it to multiple platforms. Norwood shared how she brought the issue to the #ReThinkPublicSafetySB coalition. “I wanted local partners to be involved in the process of supporting the work that was being done, as one of their focuses on criminal justice reform. Norwood and Bratton subsequently brought the #fireseylem campaign to the coalition. “We were collecting petition signatures from various COC members and supporters far and wide,” Norwood explained. “At first, we were, ‘oh, wow, we got 25,000 signatures; oh, wow, we got 50,000 signatures; oh, wow, 75,000 signatures.’” The petition signatures continued to amass until the time of Seylem’s resignation. The group sought to bring awareness to the board that their constituents shared their outrage and frustration with Seylem’s social media postings and did not feel he was fit to serve as a public servant and be employed with taxpayer dollars having made such comments about Black women, Black men and the immigrant community. Before their presentation to the board there were meetings with elected officials, including a couple of supervisors, to ask them to publicly denounce Seylem’s statements. “We had several elected officials outside the BOS that made (on the record) official statements about his comments. We approached the BOS with all of that information and with the petition and requested a review of all Seylem’s cases—since he had expressed such bias, how could you trust his investigations?” they asked. During the session with the board, several involved in the effort made public comments including Bratton, who is also a member of the #ReThinkPublicSafetySB campaign, Rev. Sam Casey from C.O.P.E. and Attorney Francine Brookins, among others. 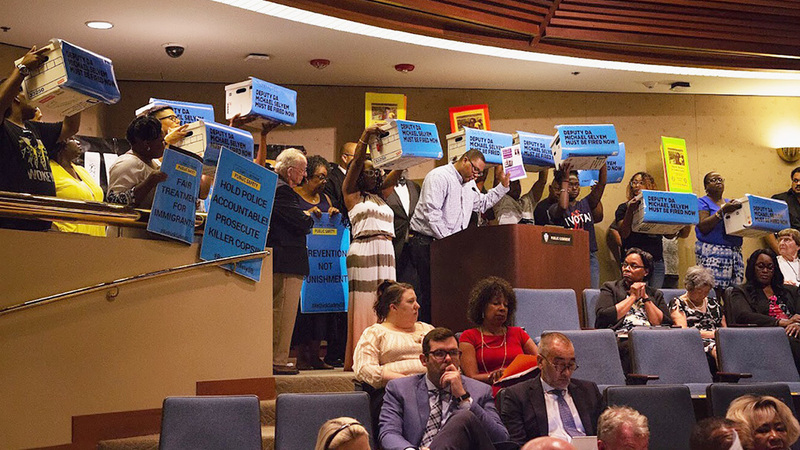 They left the petition with the board and the supervisors agreed to consider their concerns. As requested, the D.A.’s office eventually completed an investigation into Seylem’s cases, however they found no wrongdoing. This story ends where it started, after a six-month investigation into Seylem’s social media postings, he was allowed to resign. Both Norwood and Bratton had hoped he would be terminated, but overall were satisfied with the impact their efforts had in pushing the issue to resolution. “At the end of the day, I’m happy he’s gone,” Bratton asserted. “I’m a little disappointed that it took six months, I think it should have taken 6 days. At the end of the day, I’m not going to die on that hill. He’s only one person. There might be many more—we don’t know how many [assistant district attorneys] are acting on their unfair biases. The efforts of the entire coalition and all the San Bernardino citizens who supported it through the petition, speaking at the supervisor’s meeting and in hundreds of other ways showed what can happen when many come together to form the “invincible power of one.” They launched a petition, kept-up public pressure, demanded meetings, called on elected officials to take a public position, challenged the Board of Supervisors to act, and in the end achieved the desired outcome. 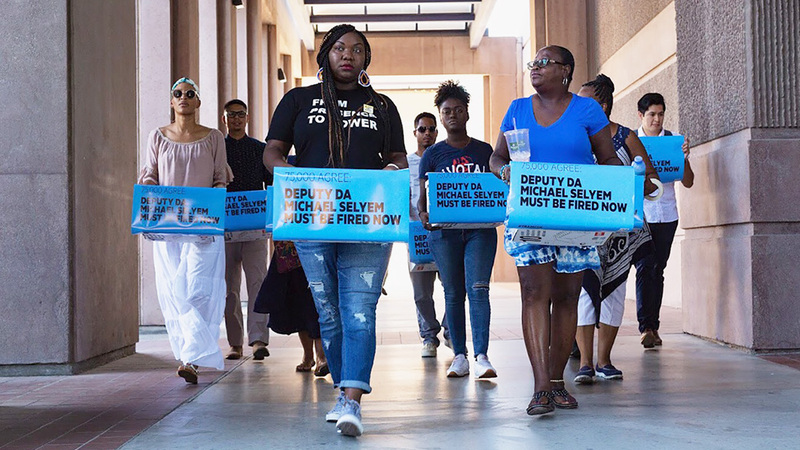 The Seylem saga was more than a story about a racist DA who was forced to resign. Behind the headlines was the story of regular citizens who came together and exercised their right to hold those elected and appointed to serve them—accountable. To learn more about the work of Lanae Norwood and Ideal visit https://www.idealculture.org/. To learn more about Bratton’s work with C.O.P.E. and the #ReThinkPublicSafetySB coalition visit https://copesite.org/2018/05/rethinkpublicsafetysb-an-ie-public-service-announcement/. NextThings That Make You Go Hmmm . . .